Expired 10mo ago . Last validated 10mo ago . Used 6 times. Laura DeLuca Offer valid online and in stores from June 7, 2018 12:01 a.m. ET to June 10, 2018 11:59 p.m. ET. Enter the code MEGADEAL to receive the discount online at checkout. In stores, please present this coupon at the register. Prices and quantities may vary in stores and online. 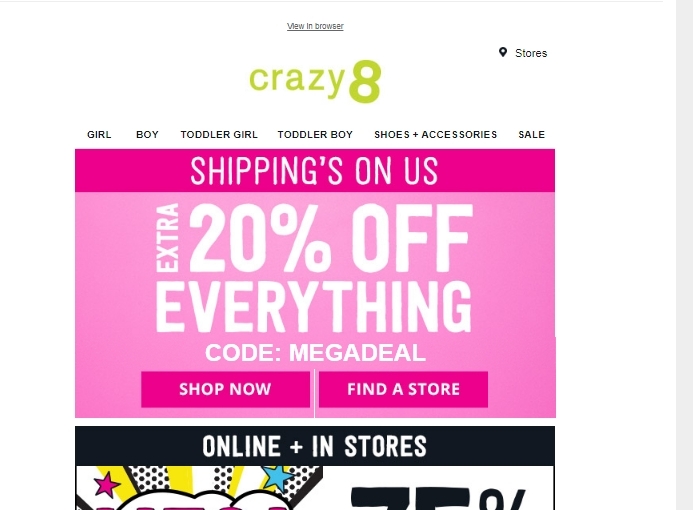 All prices in this email and at crazy8.com are in U.S. dollars. Discount will not be applied to shipping charges, taxes, gift certificates/cards, in-store phone orders, gift packaging or donations. No adjustments will be made to prior sales. Purchases made with this offer are not eligible for a price adjustment. Offer may not be redeemed for cash. Offer may not be transferred in any way. Crazy 8 reserves the right to change or cancel this promotion at any time. Valid at Crazy 8 stores and crazy8.com.